There have long been rumors about Solidworks coming out on the Mac, but Solidworks Corporation has consistently denied them. In fact the company has spoken to us directly about the issue and denied that they were even interested in the Mac. While it is very hard to tell from the image shown in this post, Hardmac.com is claiming that Solidworks version 6.0 is running on Mac OS X. There is a picture of what looks like an X11 window running a solids modeling mechanical CAD application but the menu bar doesn’t say Solidworks and the icon in the dock for the running application is a generic blue cube. There are other troubling aspects of this rumor post as well. The writer seems to think that Solidworks competes with ArchiCAD, a fully native — since the beginning of its existence — BIM program for the architectural market. It doesn’t! However, the source of this story on Hardmac.com is this blog post from coverage of Solidworks World 2010 where up on stage we seem to be looking at Solidworks presenters showing us something (which we relate to the screen shot) on an Apple iMac computer. 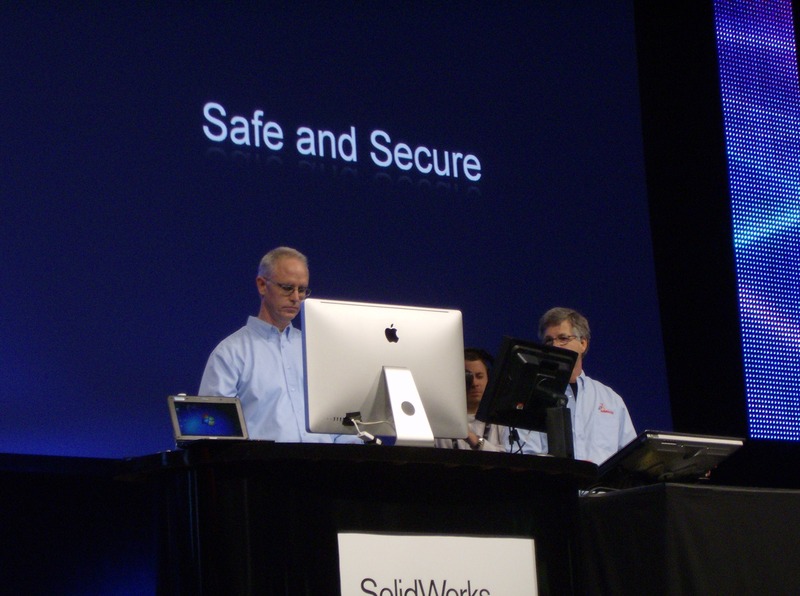 What is this iMac doing on stage at Solidworks World? It seems to us that Solidworks Corporation clearly has some reason for that iMac on stage but it doesn’t necessarily mean new native Mac software. The company already makes some viewing software native on the Mac now and it could be related to that. We’ll have to dig into this further but we definitely wanted to post this interesting nugget now! It would be nice to see Solidworks itself native on Mac OS X, but we have been told by the company that the application is so intensively developed around Microsoft’s technologies that it would be a very challenging port. can run on Mac, Linux, Windows and some other OS as well. possible for me to drop Windows OS altogether, possibly save me 100s of dollars ever year, and save time. Another good set of information on the Solidworks World 2010 announcements just made. Solidworks in the cloud means new tools on new platforms, including the Mac. Sorry Anthony, I couldn’t contain myself! !